As you walk through the halls at The Knolls, you will see a special alcove that contains a display case and several art pieces on the wall. Inside the case, you’ll see the artwork our residents have created, both at and outside of The Knolls. The newest art on display? Paintings and jewelry made by Bea, a resident at The Knolls for the past 16 years. Bea’s art has only been on display for a little while, but the community’s positive response to it was almost immediate. She has even sold a few pieces to The Knolls’ staff. The most surprising part? She’s self-taught! 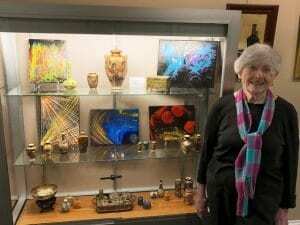 Bea may not have a formal background in art, but since she has lived at The Knolls, she has ventured into a handful of different artistic mediums: Weaving, making jewelry and, of course, painting. Bea shared that while she typically paints on her own, she attends the weekly painting class at The Knolls to meet with the guest instructor, David. She asks David for input on her techniques (including the “dirty pour,” “flip” and “swipe”), and he provides “good instruction” and encouragement. David was also the one who encouraged Bea to have an art show for her paintings. Bea explained that The Knolls has a dedicated art studio as well as a dedicated art gallery, which is curated by The Knolls’ Cultural Arts Department and regularly features resident-crafted art. She also noted that many residents participate in different artistic endeavors, whether on or off campus. For example, many residents at The Knolls get creative at local spaces such as the Rye Arts Center or ArtsWestchester. Regardless of where they practice art or their preferred creative medium, our residents have both learned new creative skills and reignited favorite hobbies. Bea went on to say that most residents have created something themselves, whether it be a piece of jewelry, a scarf, a shawl or a blanket. Call today to visit The Knolls for a personalized tour, where you’ll be able to explore the community’s artistic offerings, floor plans and more. While you’re here, feel free to check out Bea’s paintings in the display case in the art alcove – just keep in mind her lighthearted request that any criticism be kept to yourself! To get in touch for a visit, simply click here or call us at 914-461-4500.